Anticipation - The ability to read the speed and direction of the opponent's shot early. Watch for the timing speed and direction of hit. Players prepare themselves by watching their opponent strike the ball. Take in cues and clues on possible ball direction by player positioning and racket head direction during the downswing phase of the swing. Move as soon as the direction of the ball is known. 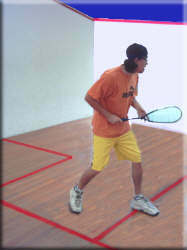 Whilst watching the racket/ball impact, the player takes off towards where they will make their return. Anticipation plays a big part when preparing to take off. As soon as the direction of the ball is realised move the feet and shoulders to start early preparation. As the opponent prepares to strike the ball start to rise onto the ball of the foot (even start to bounce) to decrease the delay in take off. Leg power/strength plays a large part in the speed of the take off. 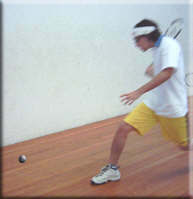 As the ball is travelling move with the ball gradually getting the feet and body in position to strike the ball. Racket preparation should occur at this time. A movement that incorporates feet, shoulders and backswing at the same time is a more efficient and fluent movement. Here is an article with diagrams to help. Where and how they will make their return. Ensure that their hitting position will give them room to strike the ball fluently and allow for, if possible, a choice of shot. 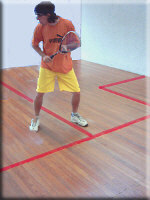 I started skipping each day to increase my speed on court After a few long rallies my legs feel tired. As the feet and body/shoulders are getting in position to strike the ball it is imperative the racket be in the "ready" to strike position. Good balance will assist making this movement smooth and fluent. 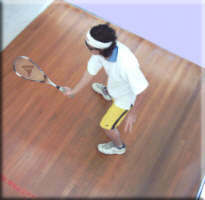 Ideally the player will arrive to one side of the ball closest to the centre of the court, being able to transfer their weight from the back to the front foot in the motion of striking the ball. Move with a fluent movement, knees relaxed, long strides. Keep watching the ball (never turn your back on the ball). When recovering from striking the ball keep a low centre of gravity. Never bring the feet together (as this will decrease the length of the stride) which will cause a loss of time, and jerky movement. Also, there was some adaption to the wrist to bring the ball straight down the wall.